Kratos' main weapons are the Blades of Chaos, a pair of curved blades on chains attached to his forearms, giving him the ability to swing them at a distance. They become engulfed in flames when used, but cool down when hung on Kratos' back. During certain gameplay, the Gods aid Kratos by bestowing their weapons and powers upon him. Kratos gains the ability to unleash a chaotic lightning storm from Poseidon, throw long-range thunderbolts from Zeus, command the souls of the damned from Hades, wield the giant and powerful hunting blade of Artemis, and turn enemies to stone using the head of Medusa, a gift from Aphrodite. Kratos' combos with the Blades of Chaos are limited, but powering them up gains many new attacks, combo strings, increased blocking speed, and powerful counterattacks. Kratos can also enable a temporary state of being called Rage of the Gods, granting him highly increased speed and power, as well as invulnerability. 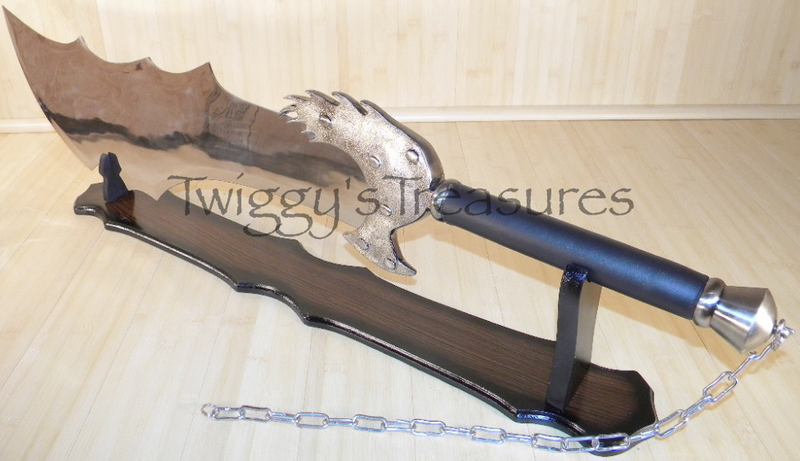 The handle is black leather wrapped with a metal decorative hilt The Blade of Chaos also comes with a chain which was wrapped around the users' arms when he threw the sword. 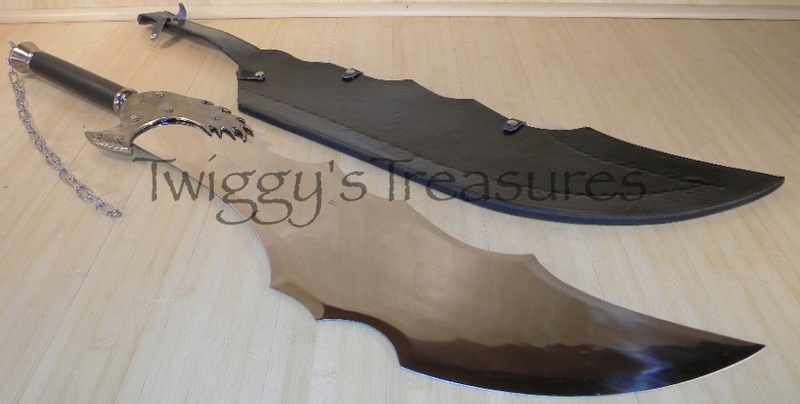 ▪ Overall Length: 42 1/2"
▪ Handle Material: Black leather wrapped with a total metal decorative hilt. Also comes with a chain which was wrapped around the users' arms when he threw the sword. ▪ Includes: Comes with a horizontal stand and a black leather sheath.